Corruption In Ghana; Let's Take The Bull By The Horn. Corruption is one big obstacle facing our democracy herein Ghana. It is clear to all Ghanaians that the level of corruption in the country is pretty high. It is found in all sectors, Police Service, Universities, Churches, Ghana Football Associate, Civil service, Ministries, Music and Creative Arts Industry etc. Corruption has eaten deep into the root of this country, so much so that many people even see the corrupt practices as been normal. Corruption is killing this country, it has and continues to damage the economy, majority populace are suffering, even our currency is devaluating considerably. A highly religious Christian nation like Ghana, According to Machiavelli, corruption proceeds from a decline in religious observance, and marches forward against liberty itself. Using history as his guide, especially Roman history, Machiavelli in his book “The Discourses” wrote that “a corrupted people, having acquired liberty, can maintain it only with great difficulty.” of which this is evident in this country. I cringe and get saddened when the selected few get richer on the express of the majority purse. But then, It will be an affront on my intelligence to explore corruption without proper logical understanding. Hence what exactly is ‘corruption’? Wikipedia admits: “There is no globally accepted definition of Corruption.” The word is used to define a very broad range of crimes – bribery, fraud, embezzlement, money laundering, price-fixing, tax evasion, racketeering, illicit capital flows, cyber crime and maladministration of funds. To fathom corruption here in Ghana, different areas need to be explored, as corruption does not prevail in one area, it covers the masses and continues to grow in the various sectors, thus the Political, Religion, Economic, Education, Marriage and Health sectors where there is existence of social classes. Corruption in the form of bribes and power, directly and indirectly is present not only in Ghana, but in other developed and developing countries, say Burkina Faso, Zimbabwe, Nigeria, Uganda, Kenya, Tanzania even United states of America, China etc. It originates due to the self-interest, materialism, cruelty and egotism among the members of different social classes in the sociopolitical settings. According to Transparency International (TI) "Corruption is the abuse of entrusted power for private gain. This is the working definition used private sectors. The Corruption Perception Index (CPI) focuses on corruption in the public sector, or corruption which involves public officials, civil servants or politicians." 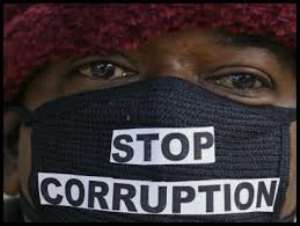 The World Bank Group also considers corruption a major challenge to its twin goals of ending extreme poverty by 2030 and boosting shared prosperity for the poorest 40 percent of people in developing countries of which Ghana is no exception. To begin with, Politically, the following are event of corruption that characterized Ghana of which affected our economic growth drastically. For your pursuance; (I) with just recent, as the Accra High Court sentenced former National Coordinator of GYEEDA, Abuga Pele and former CEO of the now defunct unit of the Youth Employment Agency and Philip Assibit to 6 and 12 years jail terms respectively for causing financial loss to the state. (II) the Kojo Adu Asare of the National Democratic party US$40 million corruption scandal. (III) Business man Alfred Agbesie Woyome, an NDC financier who faced the Supreme court of causing financial loss to the state and defrauding by false pretence after he was accused of illegally receiving Ghc51 million in 2010 for his role in the construction of stadia for the CAN 2008 tournament held in Ghana. (IV) Anas conducted a two-year an undercover investigation of the judiciary in Ghana and brought out audio and video evidence of corruption taking place. Undoubtedly, It is absolutely true that the third arm of government, the Judiciary as exercised a degree of discipline in handling corruption cases in the country. But with this judicial exercise, people still conduct same crime of corruption say looting of state resources, dubious means of awarding contracts etc. Like I always say, I have consistently advocated that, for the Judiciary to function as no respecter of any person or persons, the judiciary must be corruption free as the end they seek to eradicating corruption. I have tried to make clear that it is wrong to use corrupt hands to prosecute other corrupted hands. Following the exposé of the 22 circuit court judges and magistrates who were suspended and 12 high Court judges who were also under investigations. The twelve Judges of the High Court who were indicted in the scandal include; Justice Easel Mensah, Justice Charles Quist, Justice Peter U. Defy, Justice John Abet Nassam, Justice Ernest Obimpe, Justice Mustapha Habib Logoh, Justice Yaw Ansu-Gyeabour, Justice Ayisi Addo, Justice Mohammed Iddrisu, Justice Yaw Badu and Justice Heward Mills. Indeed, the Political elites in this country are been unjust to we the citizens of Ghana. Education secondly is another facet of corrupt practices. For the record, Ghana Education Service several months ago was accused of taking bribe and filling the list of teachers approved for study leave with their favourites, thus if you don't share same political ideology, then sorry you're out and salary related issues. Even late previous year, the General Secretary of Ghana National Association of Teachers, David Ofori Acheampong in an interview sometime with a big radio station in Accra, stating their worries about the delay in salaries; he said “We’ve gone past the era where we should be embarking on nationwide strikes because of salary. If the kind of logistics that we need to perform our jobs efficiently are denied us, why should we sit in the classroom. We are daring them that we are going to meet them and put up our statement. We are daring the Director General of the GES that if it comes to September and these things are not available to the schools, we’ll fully support them [CHASS] as an association,” This threat on government to be reactive is not only evident with GNHAT, but also TTAG, UTAG etal. Religion is another worth to probe sector which makes Corruption seen as Gold dust. The Church or Mosque as an institution does not take bribe or get involved in other corrupt practice, the behaviour of some of our men of God and Imam leaves much to be desired. They not only celebrate but venerate those whose sources of wealth are questionable. They accept gifts (offering) from just anybody without asking questions. This gives the impression that anything is acceptable in the house of God or Allah. But if Jesus can chase out those buying and selling from the temple with the declaration that, ‘My house shall be called the house of prayer, but ye have made it a den of thieves,’ then it is time to stand up against corruption. While miracles, signs and wonders are the expectations of true believers, such must be based on righteousness. To preach that one can acquire wealth without labour is not only deceitful; it is a call to corruption. It is false preaching and it is sinful. We must be careful in believing and celebrating every testimony of miraculous blessing, hence we end up being hoodwinked into celebrating corruption. The Health sector is another breeding grounds of corrupt practices. With cognizance of the fact that financial and medicines allocation doesn't go as expected, that notwithstanding give room to some individual to ride on horses back to sheepish frustrate the halves not. One should even expect that the Internal Generated Fund can be used to maintain or subsidize those patient who can't afford the bills leveled at them, rather the 'big wings' finds it quite normal to pocket the monies. As though one can't talk much because partisan politics has eating deep into our dealings, making it impossible to do the right thing because of the fear of removal from post. Government officials should know to well that our health is our life, hence channel all needed logistics, financial allocations and allowances to the appropriate quarters. It is sad our leaders fear to receive treat in their own country but rather board airplanes to developed sectors for treatment and come back to tell us to patronize "Made In Ghana". With no offence to any Political divide, What I seek and pray for is that moving forward things should get better. In any event, it would be schizophrenic to conclude that the President and his appointees are not doing well to ameliorate corrupt practices. Like the adage posit " If whiles asleep you didn't hear rain drops; when you woke up didn't you see the wet grounds " to wit, I am positive the appointment of Mr Martin Alamisi Burnes Kaiser Amidu to occupy the Office of the Special Prosecutor will not compromise itself with favoritism, nepotism and partisan gerrymandering . If I have said anything in this article that overstates the truth and impinges on any political party doctrine, I beg you to forgive me. I hope that one day in Ghana, the sons and daughters of a charcoal seller will sit beside the elite children to drink and dine together. Indeed! nothing is late when life is long. God Bless Ghana, make us Great and Strong. Youth Activist, Student Leader, Philanthropist.